"Don't talk to me about tears. Tears are for losers." 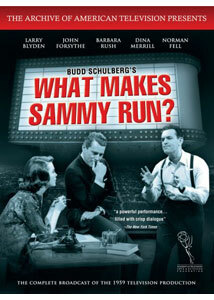 It's been almost sixty years since he sprinted into public consciousness, and still, Sammy isn't winded. This DVD brings us a marvelous discovery from a dusty vault�it's the 1959 television adaptation of Budd Schulberg's landmark novel, one that has eluded the best efforts of many of Hollywood's most talented to bring it to the big screen since its publication in 1941. (In just the last run of years, Ben Stiller, Spike Lee and Barry Levinson have all been attached to the project in various incarnations.) Schulberg is a child of Hollywood�his father, B. P., was one of the founders of Paramount Pictures, and Schulberg's memoir, Moving Pictures, is a vivid and affecting look at life in the movie colony in the go-go years around the advent of talking pictures. And of course he'd go on to glory as a screenwriter, probably most famously with his script for On the Waterfront. But Sammy Glick may be his most archetypical character, a slick talker who goes relentlessly after what it is he wants. He starts as a copy boy at a New York City newspaper, and then migrates West and moves up the Hollywood food chain, becoming a movie producer without an idea in his head that doesn't have to do with self-promotion. The title gets at the heart of the matter, in many respects�it's the unanswered refrain of Al Manheim, the only one who could be regarded as Sammy's friend, and even then only with a very generous definition of the term. It's through Al that we're told Sammy's story�it's a classic fictional device, familiar from Heart of Darkness and The Great Gatsby, among others�and part of the point is that nobody, not even Sammy, has a really satisfactory answer as to what drives this mad little dynamo. The novel must have seemed very much of its moment upon publication; this television version was produced 18 years later, so even by then it had to seem like a bit of a period piece. And for us, then, it's a chance to revisit two golden ages: of Hollywood in the 1930s, and of the great glory days of live television from the 1950s. The book is relatively brief, but it required some truncating for TV�Schulberg collaborated on the script with his brother Stuart, and the result is pretty lean and efficient. (Some of the novel gets short shrift, unfortunately, particularly the extended look at the founding of the Writers Guild.) And it's under the steady direction of Delbert Mann, who'd already won an Oscar for Marty, but who may have been most at home on the smaller screen. Larry Blyden plays the title role, and he may not be the wiry Sammy you envision from the book�still, he's awfully good in a tough role, a guy who could seem nothing but loathsome every single moment. John Forsythe is dashing and troubled as his buddy Al�Forsythe is another who seems more at ease on television, though that may be because we've logged too many hours with those horrible Carringtons, or have heard his disembodied voice so often in Bosley's office. Forsythe never displays great subtlety in his work, and the notion that his Al is a great writer seems a little preposterous, but he's asked to shoulder a lot of the load, and he's up to the task. Dina Merrill is bewitching as the beautiful, icy daughter of the money man from back East�she's the embodiment of everything Sammy wants, and reminds us about the old adage about being careful what you wish for. And Barbara Rush is the boys' Gal Friday, a novelist who has succumbed to the charms and sizable paychecks that Hollywood has to offer, and ping pongs between art (Al) and commerce (Sammy) in a quest for her soul. Frank Blair is our host for this production "presented by Crest"�it was broadcast in two installments on consecutive Sundays, and just watching the physical accomplishment is inspiring. (The ingenuity of having to bring something in on time and under budget is an art that seems to be sorely lacking these days.) Also, there are some familiar faces in smaller roles, most notably as a reminder of Sammy's past and all that he's abandoned, Norman Fell is Sammy's brother, Seymour Glick. Come and knock on his door. He's been waiting for you. Image Transfer Review: The announcer promises us that the production is "in color on NBC Television," but the surviving kinescope is in beat-up black and white. The transfer is adequate, but those decades in the vault seemed to have been pretty punishing to the print, which lacks resolution and detail. Audio Transfer Review: Irwin Bazelon has contributed a terrifically percussive, jazzy score that gets the mood of the piece; but the ambient noise and frequent static can make this a tough listen with some frequency. Again, the problem is no doubt the compromised source material, so we'll take what we can get. Extras Review: The two leading ladies provide a lovely commentary track�they're on opposite coasts but are hooked up, so there's a nice back and forth between them, reminiscing about the old days. They've got the kind of professional grace that's becoming a rare commodity in Hollywood these days, but what's especially fun is that they're not afraid to dish. We hear about their respective crushes on Forsythe (who didn't act upon them�his loss), and they just casually mention things like having to hurry out of rehearsal one afternoon to dress for dinner with Cary Grant. It's certainly worth a listen. Budd Schulberg is interviewed as well (28m:32s)�God bless him, he's alive and well and turns 95 this year, and he's practically the movie industry incarnate, reflecting on his childhood, his novels and screenplays, and old friends and colleagues like Elia Kazan. There's also a brief look (2m:11s) on the Archive of American Television, and the accompanying booklet details the history of Schulberg's story in its many actual and proposed incarnations, and provides some info on its rediscovery after all these years. A discovery from the archives that really is a treasure�it's a reminder of how powerful a writer Budd Schulberg can be, and it's a chance to revisit the glories of Hollywood studio life in the 1930s and live television in the 1950s. You'll want tables both at Chasen's and Lindy's after watching this one, though be sure to overtip your waiters�Sammy Glick has become a role model, and you'll never know just how far up the ladder they'll climb.